Keep Calm and put these stylish bottle stoppers onto your shelves in a panic! 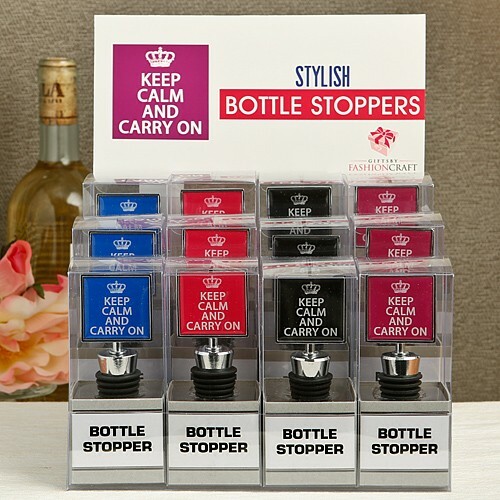 You cannot afford to miss out on the 'Keep Calm' frenzy, so we at Gifts By Fashioncraft have brought you these elegant and stylish bottle stoppers to add a classy touch to the trend! Your clients will love the fact that these 'Keep Calm' gifts are useful and practical. Stylishly designed and crafted from silver chrome plated metal, they feature a simple sign and a tight-seal stopper. Your clients can choose from four stylish colors to compliment any seriously frenzied occasion. When the party gets wild, and some calming down is needed, these will be the perfect gifts to hand out! 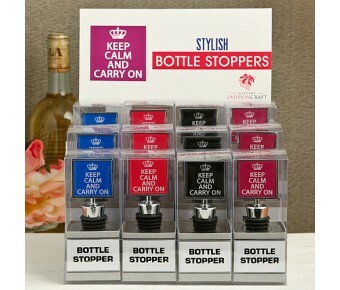 Keep Calm, keep up with the trends, put these bottle stoppers on your shelves now!